Aquabotz: Imagine that you are able to design, build, and launch a working remote controlled robot that swims underwater in about an hour. Add an underwater camera and you have the ability to image underwater scenes. 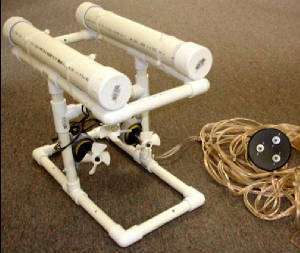 Aquabotz begins with a bucket full of ½” PVC pipes, a controller with 3 switches, connected to propeller equipped bilge pump cartridges by speaker wire and a battery. The program starts by describing the minimum needs for a working Remotely Operating Vehicle: 1) The frame is for structure and protection, 2) A minimum of 3 motors to allow all of the degrees of movement, including up and down and 3) buoyancy over ballast. One of the cool things about Aquabotz is that there is no glue involved when putting the frames together. If your ‘Bot doesn’t work to your expectations it’s easy to pull the pieces apart and reconfigure the ROV to meet success. When the Bot is deployed and the operator has gotten a handle of its workings, you’ll see your “contraption” flying around the pool and watching the image coming up the tether an onto the TV monitor. The systems are powered by DC and so are completely safe in the pool with swimmers watching and paddling nearby. Aquabotz have been built by school age students aged from the 5th grade all the way up to engineering professionals. 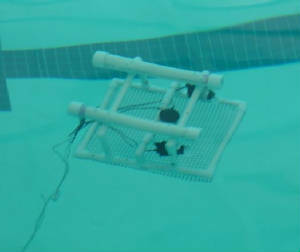 In 8 years all participants have launched working ROVs. It has been especially effective as a program for troubled youth.